When selecting compounds to establish animal models for efficacy, MOA, biomarker identification or validation, and other pharmacology studies, compounds at the HTL or early LO stage are screened via PK studies in the intended animal disease model. This exercise, in fact, helps the selection of optimal dose and dosing scheme for validation of the efficacy model. The screening PK can be done in the discrete or cassette mode. An example of discrete PK studies on the CRTH2 antagonists in mice (the pharmacological model) is shown in Figure 9 and the molecule ML5 with better PK profile was selected for further evaluation. Figure 9. Plasma concentration-time profiles of potent CRTH2 compounds in mice after 10 mg/kg discrete PO dose. Lower limit of detection is 0.3 nM. An example using cassette studies to rank order compounds based on their tumor exposures is provided by compounds in one of our discovery programs which showed high clearance (CLp) and high volume of distribution (Vd) in rodents. It was difficult to rank order compounds based on the plasma PK. In order to reduce the number of sequential PK studies to select compounds with good tumor uptake, cassette dosing studies were conducted in tumor bearing mice to directly measure the tumor uptake of compounds so that the lead compound with the best tumor PK profile could be identified for an in vivo efficacy study in a solid tumor xenograft model (Figure 10). A reference compound (e.g. ML101) is included in all cassette studies to provide assurance that DDIs have not affected either the PK or the tumor distribution of the cassette. Based on PK properties, as well as the tumor to plasma ratio, ML107 was selected to establish POC for this class of compounds following a discrete PK study to confirm the cassette data (data not shown). Figure 10. 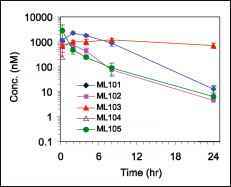 (A) Plasma concentration-time profiles and (B) tumor concentration-time profile of five anticancer agents from a cassette PK study (2 mg/kg per compound given IP) in tumor bearing mice. excellent activity. A logical reason for this discrepancy was that ML110 could not permeate the cell membrane. However, permeability experiments in Caco-2 cells did not indicate substantial differences between these two molecules. Stability of the compounds was then assessed in the cell-based assay containing buffer and tumor cells (cytotoxicity end-point was measured using the water soluble tetrazolium (WST)). ML111 was stable for 24 hours. In contrast, ML110 concentration showed a significant decline in the system. Although the mechanism of ML110 disappearance (e.g. degradation, nonspecific binding, etc.) is still under investigation, the results established the reason for the discrepancy between enzyme and cell based activity profiles of these two interesting compounds. The results also demonstrated one potential reason for in vitro- in vivo discrepancies when evaluating compounds in pharmacological models. 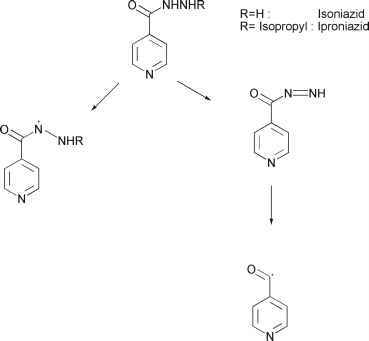 1-Aminobenzotriazole (ABT) is a nonspecific inhibitor of CYPs (Constan et al., 1999; Huijzer et al., 1989). The dosing regimen to effectively inhibit CYPs and hence decrease the plasma clearance and increase the exposure of a non-specific CYP substrate antipyrine (AP) (Sharer and Wrighton, 1996) in rats, dogs and monkeys has been established (Balani et al., 2002) and extended to mice and guinea pigs which are also routinely used for PK, safety evaluation and pharmacology studies (Balani et al., 2004). Pretreatment of animals with ABT significantly inhibits the oxidative metabolism of test compounds. This provides a useful means to evaluate the role of metabolism in compound-based toxicities, or for assessing systemic level of a compound available for a target enzyme or receptor. This approach was applied to the compound ML123 in one of our discovery projects. ML123 possesses good in vitro pharmacological activity but no in vivo efficacy in the rat disease model. ML123 has a high plasma clearance CLp (6.6 L/hr/kg) which is greater than hepatic blood flow, Qh, indicating potential extrahepatic metabolism and/or renal excretion. In order to conduct a proof of concept study in the rat disease model it was necessary to boost the systemic concentrations of ML123. Accordingly, ML123 was administered to rats 2 hr after oral administration of ABT (100 mg/kg). Clearance of ML123 decreased by 60% and AUC increased 3-fold when ML123 was given by IV. The effect of ABT was even more pronounced when ML123 was given orally to rats. There was a 10-fold increase of ML123 AUC when animals were pretreated with ABT (Figure 11). This intentional DDI helped achieve establishment of MOA which had been elusive otherwise due to poor systemic exposure to molecules. Toxicokinetics (TK) are also determined for single rising dose and repeat dose drug safety evaluation studies (to identify the maximum tolerable dose, MTD) before development candidate selection. The TK data provide valuable information such as plasma exposure associated with NOEL and NOAEL. The NOEL (or NOAEL), Cmax (or AUC), and EC50 (or AUC at EC50 dose) are used to estimate the initial safety and therapeutic index. The selection of a development candidate is based, in part, on its potency, PK profile, potential for DDI, major metabolic clearance by polymorphic CYPs, and safety and therapeutic index. Figure 11. 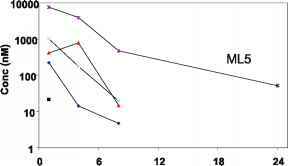 Plasma concentration-time profiles of ML123 in rats after (A) 10 mg/kg oral dose and (B) 1 mg/kg IV dose in the absence (♦) and presence (■) of ABT given orally 2 hour prior to the administration of ML123. The authors would like to thank Dr. Jing-Tao Wu's Bio-analytical team for the excellent analytical support. The authors also thank Ms. Miao Guan, Ms. Myrtha Durena, and Mr. Jackson Kalanzi of the Comparative Medicine for assisting with in vivo studies. The authors wish to thank Mr. Richard Gallegos, Ms. Ning Liu, Ms. BeiChing Chuang, Ms. Shelley Li, and Mr. Dun-Xue Mu for their technical support. Special thanks to colleagues in Drug Safety Evaluation, Medicinal Chemistry, and Pharmacology departments.